Porch sitting we were. Hot summer delta day. Grandmother said, “Did you know that you must never marry a Catholic person or a Jewish person? Intellect prevailed and she skipped over the subject; but distinctions would come from her later. And that is how it is done. Or in this case, not. Thankfully for her great great grandchildren that seed never took root in me. Shriveling into dust, it disbursed into thin air. I now think of the strong family riches that have bloomed in its absence. I loved my Grandmother. At times, she shined for me more than anyone else on earth. Born in Kentucky to George Quinn, a merchant, and his wife Mary Ann, she was encouraged to strive for a teaching degree from Western Kentucky which she did as a practical matter. 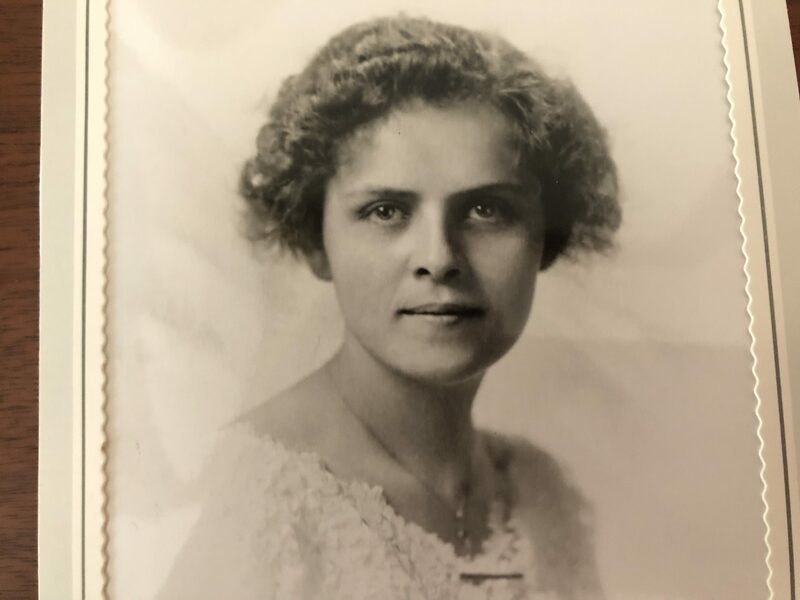 Her conversations with me were filled, not of stories about her parents, but of her golden-haired brother, Ralph, who rose from a paper boy to be the youngest editor of the Cincinnati Enquirer. She had a poor opinion of herself in comparison. She was the age I am today when I, her namesake, was born. She took the mantle of eponym as seriously as a tiny namesake could bear. A strong feature of our relationship for the next twenty years would be a reintroduction of her granddaughter, Margaret Roben to all who would listen. While teaching school, it was my good fortune that Grandmother paid a visit home one weekend to see her parents in Henderson, Kentucky. Before heading back on Sunday, she attended the First Christian Church where she met a chiropractor, my Grandfather C.M. Griffith. Two years later on July 18, 1922, they married in her parent’s home. She always said they rushed off to get an early start on a honeymoon trip to Niagara Falls and never stopped. Ready to go big, those crazy youngsters moved to the wilds of Florida. My grandfather had a passion for new horizons and Margaret was in agreement. He created The Fort Lauderdale Abstract and Title Company, quite the success until a hurricane and The Great Depression showed up with a one, two punch. They scrambled and worked to distraction becoming the solid team that I was born to know. To get back on their feet, Margaret pitched in as a French language tutor and tag teamed a hotel management business in Mississippi which my grandfather subsequently set in motion. Time away from the family took its tole. She suffered deeply over a son who, after serving as paratrooper in WW II, returned with an assortment of disappointing misadventures. As an avid worrier, she never rested even when it came to her two daughters. She was feisty. She loved to speak her mind though it was not always to her advantage, a personality trait that brings me round to that early statement that she thrust upon my innocence from her fearful self. They regained financial footing through frugality and good investments which allowed an early retirement, but my grandmother always pressed to regain the social footing that she once enjoyed. Nine grandchildren represented a way to resume the dream. She plugged into each child’s personality and for the elevation of selfhood, I plugged into her. Many of her attributes are wiggling around in me even as I embrace the role she acted out for her grandchildren. She taught me to make new friends (even if you feel shy), to love older people, to respect your life mate, to knit, to dress for the day, to be extra kind to the hard working poor, to be a library patron and to make custard. There are a few bones she threw my way that weren’t choice, but thank God I could discern the diamonds in the rubble of all that attention. Easy enough to ignore the voice that has been pinched in the salt mines. I recover daily much of her goodness in time of need – close cradling to the stove top while the pot is stirred – wrinkled hands circling my hands… click, click of the knitting needles as I lean back onto the soft bosom… Knit one, pearl two. Beat together the eggs, sugar, and flour. Add milk and cook over moderate heat stirring constantly. When thick remove from heat.